The final countdown to the February 18 presidential election began in Armenia as the seven candidates competing for the top post embarked on the last week of campaigning Monday. 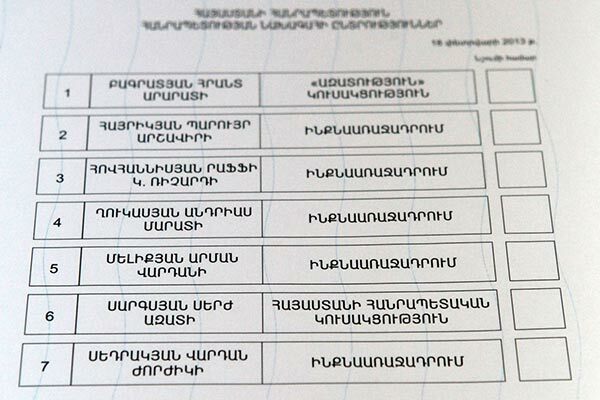 One candidate, Aram Harutyunyan, quit the race on Friday – the last day for formal withdrawals of candidacies. None of the other contestants responded to his appeal to follow suit – meaning that whatever happens in the remaining days the ballot-paper next Monday will have seven names on it. Namely: incumbent President and leader of the Republican Party of Armenia Serzh Sargsyan, Heritage party leader Raffi Hovannisian, ex-Prime Minister Hrant Bagratyan, Soviet-era dissident Paruyr Hayrikyan (who survived an apparent assassination attempt on January 31 but after some hesitation eventually decided not to seek a two-week postponement of the ballot), Karabakh’s former Foreign Minister Arman Melikyan, political analyst Andrias Ghukasyan and [self-declared] specialist on epic studies Vardan Sedrakyan. Day 22 of the campaign began with a little waiting for a possible decision by the Constitutional Court on the Hayrikyan case, but the candidate himself withdrew his application at the last moment. Under Armenian law, the date of the election can no longer be altered after the February 10 deadline. Meanwhile, President Sargsyan continued his active campaigning for reelection holding meetings in the Nubarashen and Erebuni communities of Yerevan on Monday. Addressing supporters and potential voters in the communities the current head of state emphasized that Armenia is now making headway as a society and a state, taking serious steps towards democracy and progress. One of Sargsyan’s main challengers, Raffi Hovannisian, proceeded with his presidential campaign in the northeastern Tavush region, starting from Dilijan and continuing in Ijevan and other communities, such as Getahovit, Vazashen and Berd. As usual, he shook hands and talked with ordinary people at every stop. “We have repeatedly stressed that there are all prerequisites for the new presidency to return 300 billion drams (about $740 million) to the budget already during the first year, which will make it possible to raise pensions by 50 percent, significantly increase funding for science and education, health and defense,” stressed the candidate. Meanwhile, Andrias Ghukasyan, who has been on a hunger strike since the official start of the campaign on January 21, leveled criticism at the OSCE/ODIHR election observation mission in Armenia over its second interim report, which he said could mislead the international community unless certain adjustments were made in it.